The Wellington Ram Sale on Saturday 11th October 2008. The Wellington Ram Sale @ $500 & $600. The skin on all Mumblebone rams must be soft, smooth and wrinkle free. Removing the wrinkle from the skin also removes the need to mules. Wrinkle free sheep do not need the chemical inputs to protect the wool from flystrike making them an easier care animal. Plain bodied, wrinkle free animals are also predisposed to higher levels of fertility. The wool on all Mumblebone rams must be long, white, well aligned and deeply crimped. 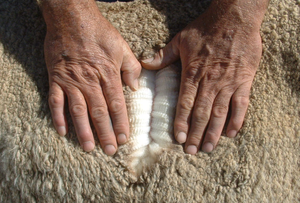 These are important traits that ensure the Mumblebone wool will stand up in higher rainfall areas and maintain its quality and quantity throughout the life of the sheep. At Mumblebone, early maturity is selected for by using stud sires with a yearling weight ASBV of +6 or better. Early maturity is important for lamb survival & growth rate. 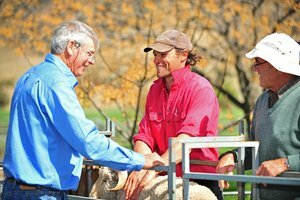 By having more lambs that grow more quickly the job of marketing of these animals becomes easier & more profitable. Larger testicles increase the serving capacity of a ram. Great importance is placed on this trait at Mumblebone as serving capacity means higher fertility. This is a highly heritable trait that when passed onto the ewe, produces more fertile ewes that rear more lambs. Mumblebone rams have a very quiet temperament. Rams that are not easily spooked will cover more ewes, be less likely to fight & less likely to break a leg jumping a fence. It is equally important for the ewe to have a calm temperament. A ewe that is easily frightened away from its lamb is of little use in a breeding program. 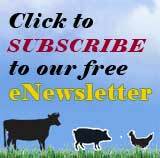 Calm ewes are also more likely to conceive. 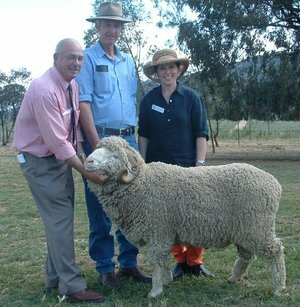 Mumblebone is known for its depth of merino rams. To add to this program, a poll sire was introduced in 2003. "263" was one of the industry leading sires for yearling weight and came with very soft, white, well aligned wool. 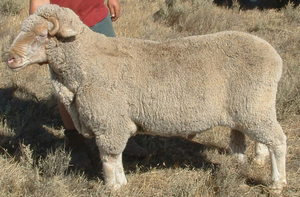 The poll breeding program has since developed and Mumblebone is now able to offer poll rams that have the poll gene from both the sire and the dam.